The following simple recipe was from SBS Food Safari - Moroccan episode. It doesn't take too long to prepare and use shortcuts such as fresh herbs/chopped garlic from a tube if you are time-poor. Alter the recipe with equal proportions of the ingredients if you have less or more meat. Instead of lamb back-strap I used lamb cutlets and the grill frying pan instead of cooking through a BBQ. During this segment, he also adds black pepper which has been omitted from the recipe. The video can be found here. 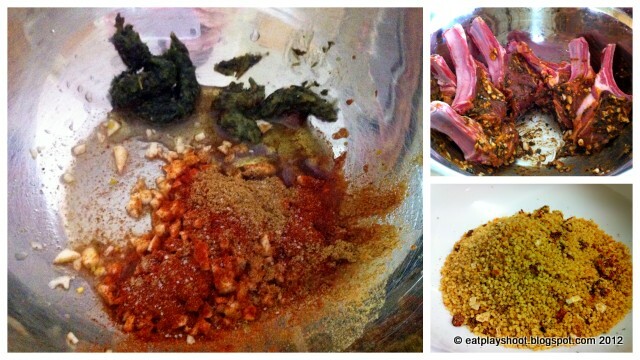 Put lamb into a bowl and add all the marinade ingredients. Use your hands to combine. Cover and leave for 1 hour in the fridge before grilling medium/rare on the barbecue. Serve with minted yoghurt: blend ingredients in a blender and serve with mechoui (marinated lamb backstrap). We served it with sun dried tomato and garlic cous cous. Quick, simple and delicious!